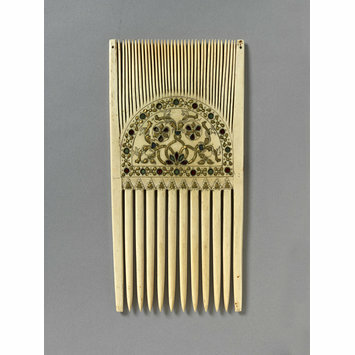 This ceremonial comb was made in the Court School of Charles the Bald, in about 875. 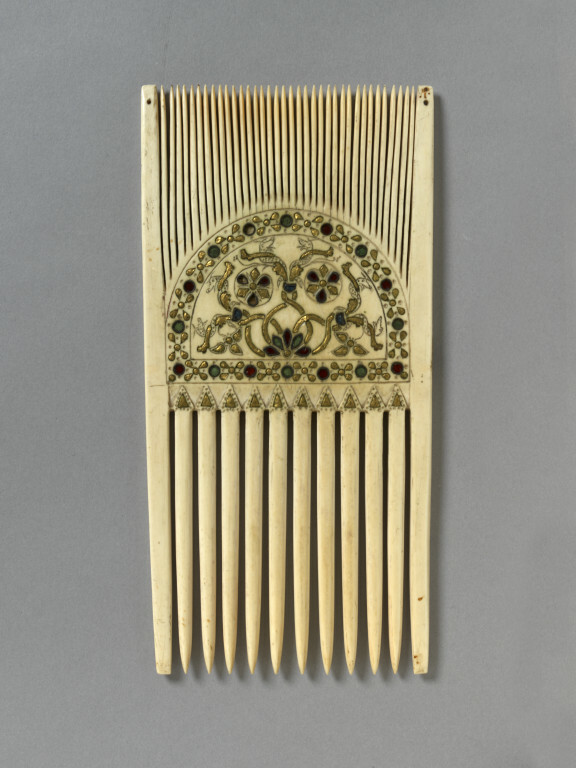 It is likely that the comb, along with other ivories, were produced in an imperial workshop, probably trained in Metz but perhaps peripatetic, especially as other objects on Metz origin also have similar decorative patterns in the borders and demonstrate common stylistic features. 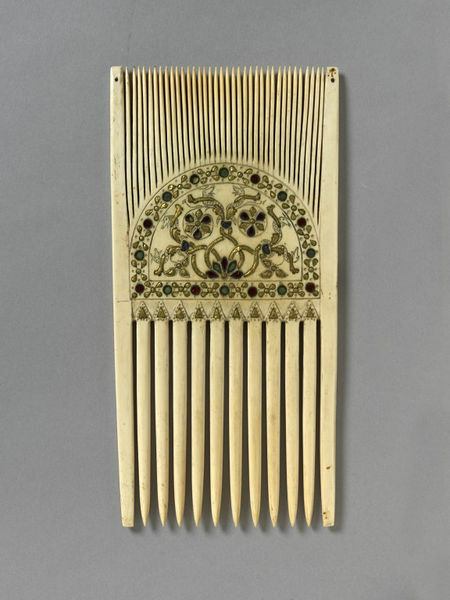 Liturgical combs were used to part the hair of the priest before celebrating Mass. This combing symbolically ordered his mind, as well as reducing the risk of falling hair contaminating the wine. The image on the comb represents Sagittarius shooting at Capricorn. Carolingian scholars were particularly interested in astrology. Combs played a major role in the coronation ceremonies of kings and emperors from the early middle Ages through to the modern era. Rectangular ivory comb. The bottom half has ten largish teeth, the top thirty six finer teeth. A semi-circular area in the centre of the comb has been carved and decorated with gold and coloured glass. One side bears an image of Saggitarius firing his bow at Capricorn in sunken relief. The other side bears a symmetrical pattern of incised snakes wound around stems. The outer main border consists of five-dot patterns inlaid with gold foil divided by alternating green and red glass circular inlays; below above the large teeth, is a row of triangles inlaid with gold foil. On the other side the semi-circular central field is made up of foliate shoots, inlaid with gold foil, emanating from a flower of green and red glass inlay and terminating in two roundels of red glass and inlaid gold foil. Three semicircular inlays at the junctions of teh shoots are made of blue glass. The comb is recorded in a life-size watercolour drawing of about 1832 when in the treasury of Pavia Cathedral. The comb is clearly a product of the workshop which produced a casket in Quedlinburg and a second casket, now fragmentary, once in Bamberg. The figures of Sagittarius and Capricorn appear in closely similar form in both caskets, and the distinctive engraved and spotted serpents on the back of the comb are identical to those on the caskets. Combs played a major role in the coronation ceremonies of kings and emperors from the early middle Ages through to the modern era. It is likely that these ivories were produced in an imperial workshop, probably trained in Metz but perhaps peripatetic, especially as other objects on Metz origin also have similar decorative patterns in the borders and demonstrate common stylistic features.